From the Natural Regional reserve of “Lago di Serranella” you proceed along the trail of vegetable gardens following the direction of the protected area (the maintainance of the pathways may result in some deviations). The trail leads to the ancient church of San Francesco in Guarenna di Casoli. From here, you will find a natural terrace at the meeting of the Aventino and Sangro rivers, you will easily reach the SS84 by turning left at the junction. After crossing the bridge over the river Aventino you find yourself in the territory of Altino, place name Selva. To avoid using an extremely busy road, when you cross the bridge you can take the road on the right, taking you through Raffaele Mattioli .Follow the road for 500 Metres, keeping tto he right at the first junction, and you’ll find yourself on Via Benedetto Croce. You will encounter several groups of houses, before turning right once again on Via Nicola Moscardelli. From here, after a short stretch of tarmac road, you will once again come across the white dirt track which runs through cultivated fields in a south-westerly direction. The irrigation of these fields using a channel system made this area extremely fertile and farming is still a very important activity here. At the junction, you take the tarmac road to the left and after just 100 metres you turn right. You continue for a short time on the tarmac road and then proceed once more on the dirt road. After about 800 metres, the trail reaches the Rio Secco stream and runs along its right bank for short while. You gradually climb up towards the SS84, and on the opposite hill you can see, the town of Altino. Leaving on the state road, you proceed to the right and cross the bridge over Rio Secco. You walk along the straight road for about 2km, crossing Contrada Vicenne di Casoli, and then turn left near the Shrine dedicated to the Virgin Mary, continuing along the dirt road on its right. The climb to the town of Casoli is beautiful and scenic, walking among small wooded areas and cultivated fields. You continue to climb for about 2.5 km and a farm you take the path on the right for another 500 metres , finding yourself at the towns sports ground from here you can proceed towards the town centre following the directions. Casoli (378 metres above sea level ) is the first large town you come across along the road. The Ducal Castle and the former internment camp, are now just places of memories, but they are really important if you wish to get to know and understand the historical events associated with the Second World War in Abruzzo. 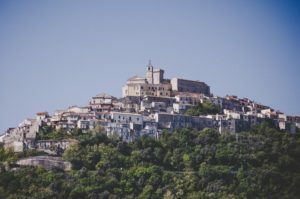 Starting from Casoli, and continuing along Corso Umberto I for its whole length southward, and once you reach the roundabout take the second exit on Via Cavassuti After about 1.5km from the roundabout, after passing two detached houses, you turn right and go uphill. 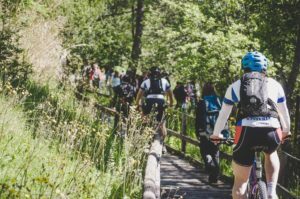 The trail runs south-west, through pleasant woods, and at the junction on the bend, you continue to descend on the left hand dirt road for 500 metres, at the end you turn left and head southward, travelling a short distance in the territory of Roccascalegna. When the trail opens up, you will see the Eastern Majella panorama uncovered on the right and the Sangro valley on the left. After passing the iron cross at the crossroad, you will encounter several houses in a place named Grotta Rimposta di Casoli. After walking past the last house, you proceed on the path on the north-west limit of the Site of Community Importance “Juniper brush of Juneperus macrocarpa”, a site of high environmental importance for the diversity and richness of habitats. Passing a few ruined sheds, you leave the white dirt road and enter the SP Peligna, proceeding southward for about 4.3 km. After several turns you will arrive at Gessopalena town centre (654 metres above sea level). The old centre of the town stands on a rocky chalk outcrop, in ruins after the German raised it to the ground January 1944. Reclaimed but without any formal reconstruction work the ruins have been left in memory of the slaughter which took place in this location. Arriving in this hamlet at sunset will lift your spirits and make you forget any walking fatigue as it is possible to embrace a wonderful panorama of both the Majella mountains and the Adriatic sea.